Dining at the Walt Disney World Resort can be a big part of your Disney World Vacation experience. There are so many different dining experiences to enjoy, that you never have to have the same vacation twice. Today at Only WDWorld we take a look at the most popular of the Epcot restaurants, Le Cellier. Located in the Canada Pavilion, Le Cellier Steakhouse recently made the move to the rank of Disney Signature Restaurant status. This included an overhaul of the Dinner menu and a dramatic increase in prices. For those more value oriented you can still get a great meal there during lunch with a wide variety of choices and more reasonable prices for this top notch restaurant. The lunch menu and the lunch time dining experience is what we will be reviewing here. 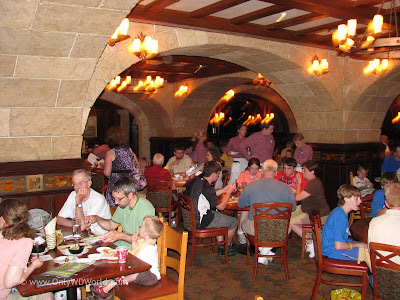 Le Cellier continues to be the most popular restaurant in Epcot and reservations are a must. This is especially true during lunch hours of 11:30 am - 3:00 pm, when you can still dine at this great restaurant without paying the Signature Restaurant prices that you will see during Dinner hours. 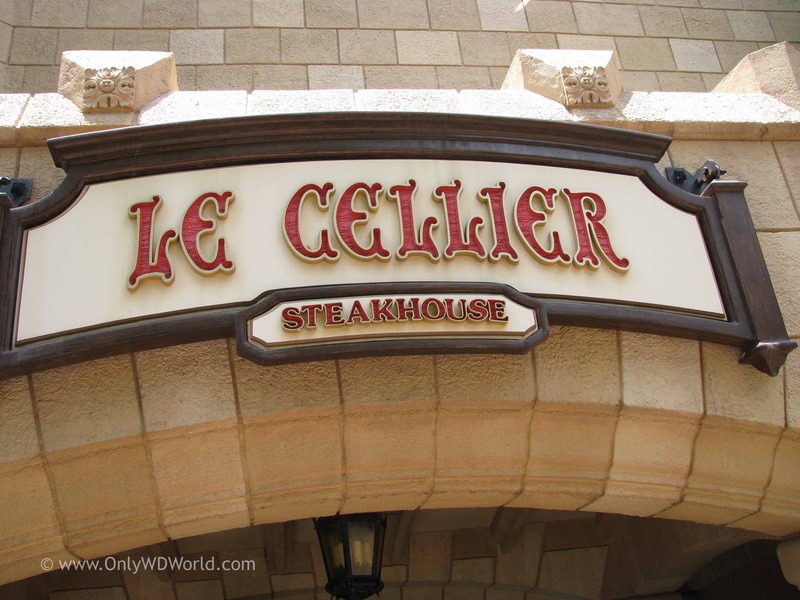 Disney World has put the Le Cellier Lunch Menu online which makes it easy to see your options. Le Cellier literally means "The Cellier" aka basement, providing a somewhat darkened setting with stone walls. Although it is suitable for families, it also makes a great place for couples to dine. During our review lunch, my family of 4 tried different entrees ranging from soup & salad to Le Cellier's Signature Filet Mignon. 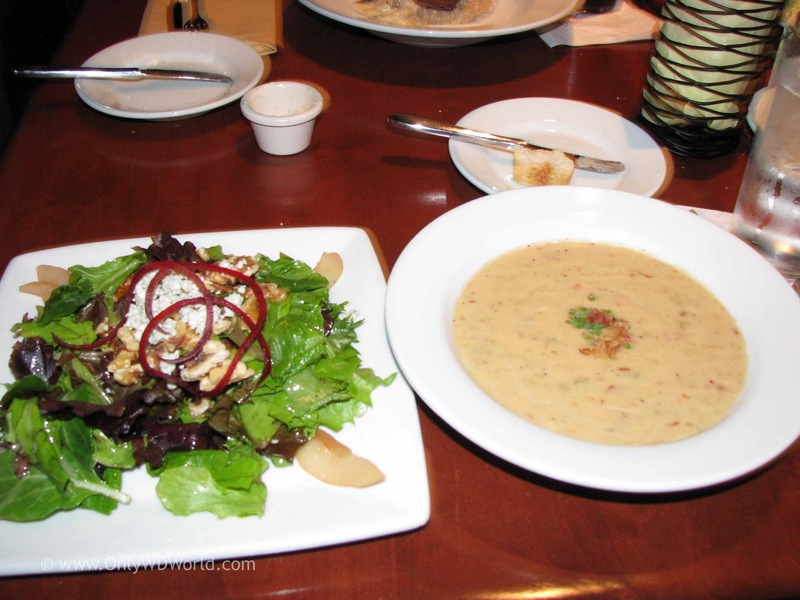 Soup & Salad at Le Cellier is certainly not your typical fare, especially when it includes a bowl of the famous Le Cellier Canadian Cheddar Cheese Soup. The basic salad was also a work of art. Although billed on the menu as "Soup & Salad" if you order a bowl of the Cheddar Cheese Soup and ask for the "House Salad" to accompany it, you will get one of the best and most economical meals at a Disney World Table Service Restaurant. The most difficult part about this meal is that you are ordering soup & salad when there are so many tempting dishes on the menu. The Soup lives up to all of the hype and is highly recommended. Forget the tiny portions that you can get at the Epcot International Food & Wine Festival and opt for an entire bowl! My son opted for the Caesar Salad with Grilled Chicken. The is a great entree salad that he thoroughly enjoyed. The portion was large and it was very filling. Both my wife and daughter opted for their favorite item on the Le Cellier menu: Le Cellier Mushroom Filet Mignon served with Wild Mushroom Risotto and finished with a White Truffle Butter Sauce. For a lunch price of $26.99 versus the $41.00 price for this dish during dinner hours you can't beat it. This is truly an amazing dish and is also highly recommended. 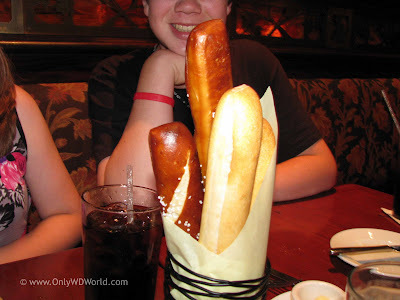 Don't forget that any meal at Le Cellier includes their complementary bread service including Sourdough, Multi-Grain, and Pretzel bread sticks. 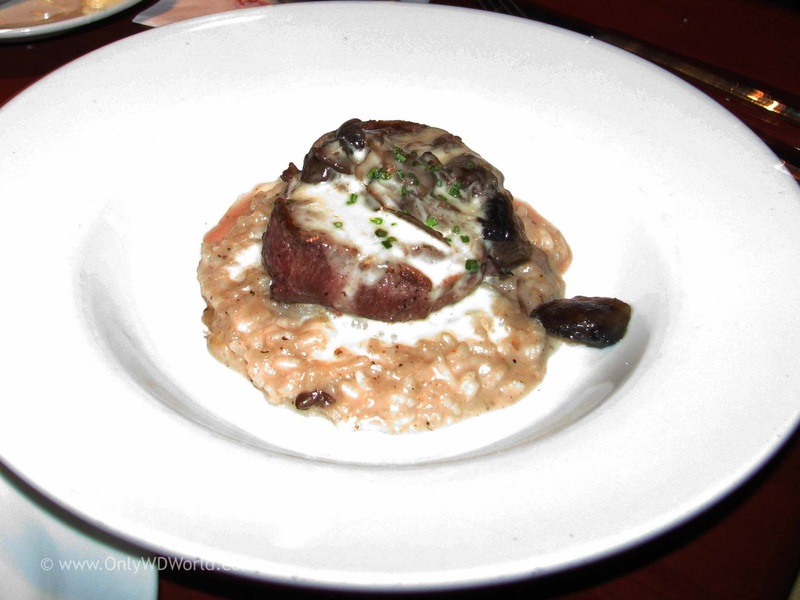 Le Cellier provides the Disney World Guest a chance to have an excellent lunch with a range of price points from around $15 for steak sandwiches, entree salads, or soup and salad options to $27 for their signature filet mignon. The food is incredible and this is definitely one restaurant that is worth making the reservations way ahead of time to enjoy. Even if the new Signature Dinner Menu is out of your price range, don't be afraid to dine here for an incredible lunch. 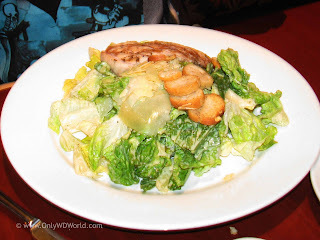 0 comments to "Disney World Dining: Le Cellier For Lunch"